Goodgame Empire - known as Empire: Four Kingdoms on Android and iOS - is a free-to-play Castle management war MMORTS which can be played directly from any browser. In the game you will begin managing a small castle, and with the help of several characters, you'll earn resources, construct buildings, train an army, and expand your domains, conquering territories of evil Robber Barons and even other players. Complete fun missions and challenges to earn experience, and unlock new buildings and features. Building materials - resources such as wood and bricks are fundamental in the construction of the various buildings. These materials can be earned through several buildings. Population - To maintain your city running you will need to build dwellings to accommodate your growing population that will put your buildings to work. By increasing your populous players are able to earn a second area resource: coins. Coins - To get coins you are able to tax your people to bring gain coins, which are typically spent on purchasing recruits into your growing army. Food - In addition to paying your soldiers, you have to feed them so it is necessary to have constant sources of food. Each Castle that you will is made up of its own land area, identified by a grid that allows you to build upon it, each building taking up a certain amount of space. 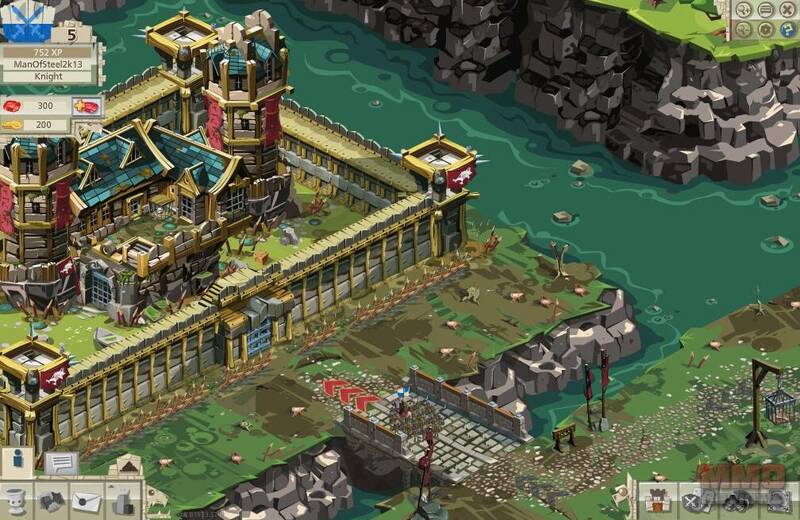 The buildings you can build range from dwellings, walls, tower defences to barracks where you can recruit soldiers. As well as building a new building, you can also improve existing buildings into a new and improved version. As you progress through the game you'll receive missions, which prompt you to build certain buildings or units, or invade nearby barons castles. Complete these missions will allow you to explore and uncover more about the land in which you live. Outside your Castle walls there are a number of NPC’s that offer daily challenges that operate outside the scope of general story progression, such as attaining level 10 within an allotted time to earn massive amounts of rewards. Through completing various tasks and challenges given to you by the various NPC's, you will be rewarded with experience and resources and the games storyline will also push forward. Experience will increase your level, in doing so you will earn rubies as well as unlocking new buildings, units and features within the game. The game is completely free to play, but players can buy rubies, the games premium currency that can be used to accelerate the production time of buildings and units. At the beginning of the game, the Ruby requirement is minimal, but as the game progresses players will require to spend more rubies to use this function. However away from purchasing rubies players can still earn them in the game by levelling up and completing challenges.